Why isn't python 3 the default python binary? I type python in a terminal window. I get Python 2.7 and not Python 3.5. According to the docs, Python 3.5 should come preloaded. for the time being, all distributions should ensure that python refers to the same target as python2. type python and file /usr/bin/python will confirm this. The reason for this arrangement other than the convention, is that the source package python-defaults in Xenial is the version 2.7.11, so the python symbolic link points to this version. To use python 3 you have to be explicit and type python3 in the command line, which is recommended in case you need an specific version, this can also be done with python 2, typing python2. Ubuntu includes both python 2 and 3 versions by default on all current versions. There are plans to migrate everything to python 3 and marking it as the default. To get the Python 3.5 REPL or run a script that's compatible, type python3. This is to maintain compatibility with all the legacy python 2.x (which has always been, and will remain linked to python). The dash could find python if you set up a .desktop file for it (in ~/.local/share/applications/), to open a terminal and start the REPL for instance. There isn't a default GUI REPL environment for python, and normal interface expectations are that the user would go to the terminal. The talk of python 3.5 being default is the maintainers porting all system scripts from python 2.x over to python 3.x, not that python 3 would replace python 2 in all cases. You assume that the default Python should be available as python. That assumption is wrong. On a system that comes with Python 3 “preloaded” and no Python 2 at all, there will be only python3 and no python. Code written for Python 3 should always look for an interpreter called python3. Code written for Python 2 will historically look for python. “Current old” systems will have no knowledge of python2, only python, so it makes perfect sense to keep Python 2 code looking for python. This is the reason why python should refer to Python 2 for “as long as Python 2 code exists”. New code written for Python 2, if that makes sense, can perfectly look for python. It might also look for python2, if it is intended to run only on Python 3 aware and well groomed systems (which should offer such link). Below image will help you. Python 3.x should work with 16.04 - Actually, it definitely WILL work. I have Ubuntu 14.04 and I have Python 3.4.3 - All you have to do to test it is type in python3 and it should tell you what version you're running. Not the answer you're looking for? Browse other questions tagged python3 or ask your own question. 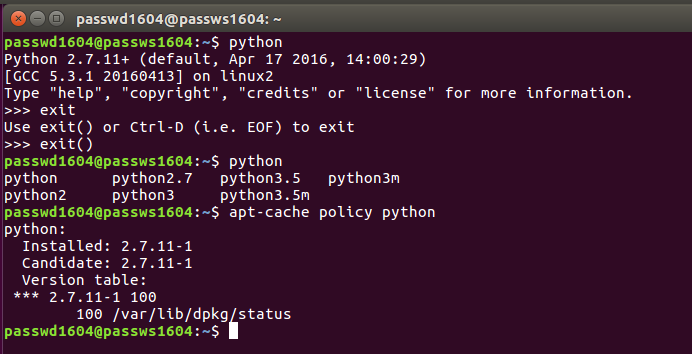 Why are multiple versions of python present on Ubuntu 16.04? How to change default idle for python? Why does Ubuntu 16.04 come with Python 3.5 but not pip3? how to install python 3.5 in wine?